California kids are just like other states’ kids, right? Few parents, even "active" ones, understand the massive California school system accurately. How big is the California school system? What is the Nation's Report Card? What is the NAEP test? Is the NAEP test fair? Are poor kids dragging down California's test scores? How does California rank on test scores? What are the key themes of Ed100? Does Ed100 have a blog? Many think they do — after all, they lived through their own education — but a dose of humility is in order. The education system as a whole rarely changes much from one year to the next, but it has changed quite significantly since the Great Recession of 2008. Myths and outdated ideas have a funny way of sticking around. Millions of students. California is home to 40 million people, including about 6.7 million students in K-12 grades. About one of every six people in California is a K-12 student. Each grade level enrolls roughly half a million students. Thousands of schools. There are about 10,000 California schools — more schools than Starbucks. Thousands of teachers. Throughout the USA, there are more teachers than soldiers, or doctors, or lawyers, or police officers. There are about 300,000 teachers in California. Billions of hours. Each K-12 student spends about 1,000 hours in school per year, for an annual collective total of 6.7 billion hours. For perspective, that's more than the cumulative hours spent over a decade to launch the Apollo mission. It's about 20 times greater than the total hours spent to build the pyramid at Giza. There are sound reasons why this mammoth education system has to be complex. 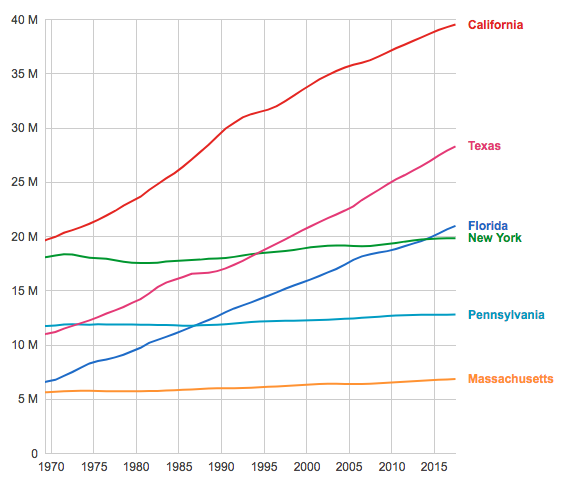 Like Texas and Florida, California's population has grown rapidly. The students in these growing states have all kinds of different needs. To serve those needs and balance among them, the education system must be simultaneously massive and personal, which makes complexity unavoidable. To work for all students, it has to work for each student. That's an authentic challenge. But we're getting ahead of ourselves. Getting education right requires getting lots of things right. It's too much to think about all of them at once, so Ed100 breaks it down. You can make sense of the system, if you take it one topic at a time. Ed100 explains California's education system, busts myths, and explains what you need to know. Wait, you might ask — do I really need to understand the system that governs California schools? Is it even possible? The answer is yes and yes. Understanding the system is helpful for the sake of your own kids, of course, and the point of Ed100 is to make the system learnable. But there's something bigger: like it or not, you, as an involved parent or community member, are the heart of California's education accountability system. There is no independent watchdog in the system. You are it. The system literally depends on the vigilant support of local, active, informed constituents to speak up for what's right and what's needed. To wield influence when you need it, you have to know what you are talking about. Ed100 can help with that. California school results have improved a lot over the long term. But they are still pretty mediocre. The core content of Ed100 is a set of short lessons, including this one. (We have a blog, too, and a resource library — but the lessons are the core content.) You are reading Lesson 1.1, the first lesson of the first chapter. At the bottom of each lesson you will find a simple quiz that reinforces a main point. Pass every quiz and you become an Ed100 Graduate. Here's the main point of Lesson 1.1: California's K-12 educational results have improved a lot over the long term. But they are still pretty mediocre. How Can We Tell if California Schools Are Behind? Very few children actually take the NAEP tests. Very few children actually take the NAEP tests. These are not the tests that all students are required to take each year. (Those are called the CAASPP, or the "Smarter Balanced" tests.) NAEP is separate, and its purpose is purely statistical. Very few children actually take these tests. Designed to be consistent from place to place and from year to year, it evaluates how well students know the basic academic content associated with their grade level. Scores on NAEP, though imperfect, enable researchers and policymakers to monitor the overall education system, comparing student achievement between years, states, grades, and student "subgroups" (for example by race, ethnicity, or socioeconomic factors like family income). NAEP scores don't tend to change quickly. Frankly, almost nothing in the education system changes quickly — and this is a recurring theme of Ed100.org. Each year, scores bump up or down a point or two, but the best predictor of next year's score tends to be last year's score. It makes sense, right? The education system is like an armada of giant ships, each rowed by thousands of little oars. Each year the people rowing have a lot in common with those who rowed the year before. The underlying currents surrounding a school community tend to change slowly, too. Books and tools might change a little. Teachers evolve their lessons, or move, or retire, or shift grades. But on the whole, change tends to happen slowly in each school system. California's Scores are Low. And also Ordinary. Unfortunately for California kids, these stubborn scores appear to matter. Most education researchers reckon that a ten-point difference in NAEP scores represents about a year of difference in academic learning. If true, California's students are years behind those in top-scoring states like Massachusetts. Perhaps these tests aren’t quite fair to California students. For example, administration of the test may vary a little by state. Some states provide extra testing time to English learners. Texas exempts students from the test if they are so new to English that they would bomb it. These small differences in administration probably matter a bit; small differences in state scores shouldn't be taken too seriously. Also, maybe the rule of thumb is wrong. Maybe ten points of difference isn't equivalent to a year, but more like nine months. Or six. Anyway, tests don’t tell the whole story, right? There are many ways to measure Success. California’s children are not within quibbling distance of the skills of children elsewhere in the country. These quibbles miss the point. The fourth grade reading assessment evaluates whether children can read short passages and understand them. The math questions are similarly basic. Year after year, the big picture is clear: compared to other states, California's students aren't within quibbling distance. They are behind. Ask a family that has moved to California from the east coast for their perspective. At minimum, they will almost certainly tell you that class sizes in California schools are much, much bigger. Does it matter if California children start off slowly, one might ask, so long as they catch up later? Unfortunately, most don’t. For many years, research has shown that children not reading at grade level by the end of third grade are at serious risk of never graduating from high school. It's important to acknowledge that most of California's NAEP scores look less bad if you "disaggregate" them, looking beneath the average. Some groups of students tend to do better than others. In 2017 California's white students in 8th grade ranked 23rd in math, for example — about average. Wait, some might ask — does this mean California’s lackluster NAEP scores can be explained by demographics? This question begs another in return: should it matter? Are poor results somehow better for California, or for kids, if they can be "explained" by the state’s larger numbers of non-white children and children in poverty? Is it useful to imagine it as their fault? The children in our schools grow up to become the workers and leaders of our communities. If we want California to have a bright future, can we afford to accept demographics as an excuse for bad scores? In any case, the data leave little room for denial. California’s children in poverty generally score starkly behind those in other states, as do California's Latino students. But California's white children aren't exactly leading the parade, either, and neither are Californias kids that don't qualify for the lunch program. These results are not accidental or surprising. They do not zigzag from one year to the next or change quickly in response to small changes in policy or practice. They are the long-term output of a large, complex system. One important finding from the "Portrait" report mentioned above is that California's system underperforms partly because it is designed as a K-12 system. The disparities evident at every grade level reflect differences in school readiness present at the start of kindergarten. Kids that start off behind are at real risk of never catching up, and California's system does little to prevent it. California's education system is massive, but education is personal. Easy answers are tempting, but usually wrong. For education to work well, many things have to work well at the same time. Money isn't magic, but it can buy things that sure help. On the other hand, the lack of money can really hurt. Not everything of value in education is denominated in dollars. Reforms have a shot at making a difference if they change who is in the room or how time is spent. The long-term trends are almost all good. Better to be impatient than pessimistic. People working in education almost always have good motives. Listen harder. Public education ultimately relies on public will, measured in taxes. Not all research is good research. Be suspicious of counterintuitive findings. When in doubt, look at what rich families do for their kids. Perhaps you found your way to Ed100 because you want to help make things better. There are many approaches to change, and we will explore them one by one. It's important to lay the groundwork first, so let’s broaden the context a bit. The next lesson examines how California compares not just to America, but to the world. Scroll down just a little more to take the quiz for this lesson. Pass it, earn your ticket and keep going! Updated May, 2018 with refreshed state rankings. Updated September, 2018 with GDTFII findings about the persistence of pre-K gaps. True or False: The "Nation's Report Card" (NAEP) test is administered to ALL students, annually. How is the sample of students selected? As a parent who was at a recent PTA meeting - it struck me that who is at the table really matters. If an informed, engaged parent community is essential to student success but we haven't found a way to get parents, specially those parents whose kids are most at need, at the table - we are only really addressing the concerns of the privileged few. As you indicate above, reforms can make a difference if they change who is in the room. I think as parents, we can do our bit right there. Hi Namrata, thanks for your comment. Who is at the table absolutely matters! All parents should be but for myriad reasons, it all too often falls to a select handful who show up. Parents have been allowed to hover around the periphery for so long that the idea of parents playing an essential role in the success of California's education system sounds like a novel concept. Building informed and engaged parent communities isn't just going to happen. Which is why we hope you take the Ed100 lessons and share them far and wide. At Ed100, we want informed and engaged parents at the table in every California school so you can make a difference. 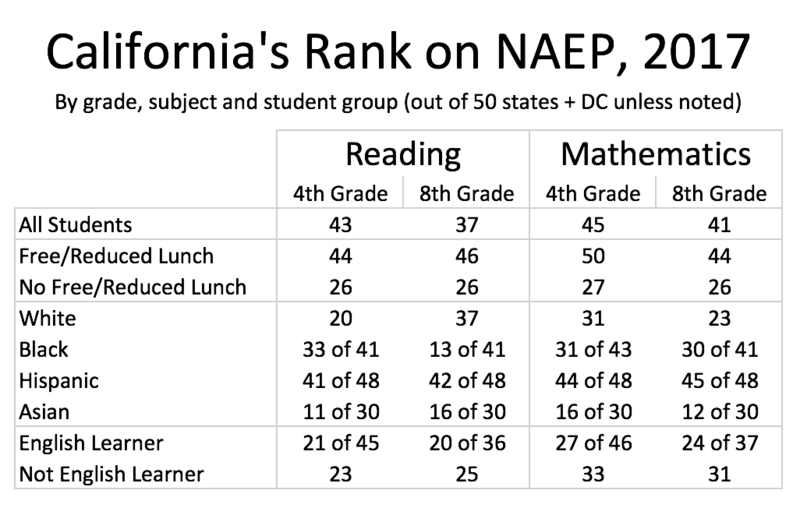 why there is only one value number rather than the range on California's Rank on NAEP 2017 for white students group ? someone knows the actual range? I'm in 5th grade and this is WAY more fun and interesting than Lexia reading. Hi Miela, thanks for stopping in. You actually taught me something because I had to look up what Lexia reading is! Whatever you do, never stop reading. I'm just going through my preliminary administrative services credential program. Ed100 is helping me stay current and relevant! Thanks for the kind words, Eunice. Best of luck with your program. We would love to hear more from you as you work toward becoming an Ed100 graduate. Hi there Caron, thanks for your comment-we are glad to hear that you are both learning and enjoying the material. Ed100 works hard to provide relevant, data-driven content. The links included in the lessons take readers to many of the sources utilized but we can always do better. Is there a particular data point that you are unable to find the source for? Yes, I learned many things I didn't know before. But more importantly, ed100 put together, in a very organized manner, what had previously been very disjointed knowledge for me. As an interested parent, you learn snippets of this and that, here and there, but it doesn't have full context. Ed100 puts everything together. Its great for summaries with links where you can read more if you need the details on that topic. If you do the entire course, it's great for putting educational issues in context and giving a better sense of magnitude than "how often the topic appears in the news." Hi Sonya, thanks for your great comment. We love our Ed100 graduates! Congratulations on finishing the course and becoming a more informed parent leader. We look forward to hearing more about how you've applied your Ed100 knowledge to improve your school community. Do you know how children are selected to take the NAEP test? The process is described here: How the NAEP sample is selected. It's similar to how a statistically representative survey is designed and administered so that it can be consistent from one year to the next. Agree! Ed100 lessons are fabulous for ANYONE!! I've encouraged a number of colleagues to jump on and all have excited shared that they learn in every single lesson. We've begun parent workshops in the district to encourage more to engage with Ed100 and it's going well so far! Thank you so much for this incredibly valuable resource! What a nice comment -- Thanks, Jacqueline! You might be interested in our new series of tools to help PTA leaders pull together and persist through to becoming Ed100 graduates. The general idea is to plan ahead to complete one chapter per month. We are introducing new Ed100 discussion guides and videos to support this approach. Important to acknowledge: in 2017, California was one of the states where NAEP scores improved, overall. Few have swaggered about it much because (as indicated above) the state still has such a long way to go. "Money and Freedom: The Impact of California’s School Finance Reform"
This new research suggests that money targeted to the needs of students, and allocated by local districts to meet those needs, can make a difference in student outcomes. In the paragraph asking if someone or something is to blame for low California NAEP scores, I get that the idea is there's no one someone or something. But missing from the list is underfunding. You get what you pay for. And while that is not the entire answer, it deserves to be part of the list, and a big part. In 2016, more than half of the students at almost every grade tested did not meet the California standards. Another aggravating reality--in 2016 more than half didn't meet the standards? And to be honest, California standards don't seem that sky high in the first place. I wrote a county-level browser for CAASPP results a few years ago: https://common-core-ca.shinyapps.io/caaspp/ It lets you check out schools in up to 3 counties at any grade level for Math or ESL. I am really surprised to see that California's scores are that low. Some student does not do well on the test because they do not work well under pressure. You can find a history of California's NAEP results on California Department of Education web site that includes comparisons with other states as well as results based on ethnicity and low-income. Thank you for the information. Its very useful and important. However I think language is important. I don't think we should ever describe an accommodation such as the one mentioned for Texan ELs as 'cheating'. We can debate whether accommodations for distinct groups are neccessary or useful but I do not think we should not use emotive language to describe it. Thanks for your close reading and suggestion. The Urban Institute provides state comparisons of NAEP scores adjusted for demographics. Take a look at where California ranks. Tip: Look towards the very bottom of the chart. In our district, it seems as though there are more stereotypes on how well students should be able to do. With the community being, largely, Asian and Filipino (50%) it's almost as though the culture and community is driven by their interests. However, Latino and Black students are continually performing at the lowest levels within a resource-rich district. Parents living in the city are not engaged in what it requires to ensure a student succeeds. Teachers cater to the "easier" students versus dealing with those that have challenges (social, emotional, academic). When our group asked parents how well they think the district performs and then the state...they were shocked to discover the demographics. What was also a shock to them was the low performance amongst all the demographics in various subjects. Looking at our local performance levels in relation to the state-wide and national...seems to reveal more than what administrators are prepared to address. I don't know what you base your state on in regards to "Parents living in the city are not engaged in what it requires to ensure a student succeeds. Teachers cater to the "easier" students versus dealing with those that have challenges( social,emotional,academic)." I am a Parent Volunteer and I know for a fact that in spite of the parent's personal obstacles , for example not having a middle school or high school diploma does not keep them from being involved in school activities that enhances test taking techniques, and time management techniques for homework. Also over 40 percent of our student population are special ed. students that have social,physical, emotional, and delayed memory problems. As well as those who are in need of help academically. In spite of the fact that there are some who have "low"test scores, there are some who test "exceptionally well" when it comes to test regardless that their in special ed. or not. I have seen some excellent commentary and read some great questions. As a mother of very intelligent young people and a stickler for homework, I strongly believe that there are many tangible variables that contribute to the low test scores and in my opinion, the cheif one is lack of hope. Call me crazy, many do, but if students don't have hope they are not likely to dream. No dreams, no goals. No goals, zero motivation to do much of anything worthwhile. I see it in my senior, who spent many years with a father that told him he would never need the math he was learning and still struggles with basic math concepts. Those that believe in our kids, our students, our true natural resources will continue to inspire and support to the best of our ability. Our kids need to learn how to do this for themselves and each other, to never ever give up. Motivation is a challenging and vital aspect of education. Have a look at Lesson 2.6 for more on the subject. Funding cuts happen across the board and it has become difficult to provide services to students that need them most. Many school administrators and teachers have to wear many hats and this in some ways derails what teachers need to focus on and that is teaching. Lets get back the funding needed to give our students the services they deserve and need to become productive citizens of our future. have terminated ALL PARENT EDUCATION CLASSES (aka Mommy and Me), I confidently predict even worse academic results for our students. In our El Monte-Rosemead Adult School we have provided Parent Education classes since 1936. Now, these classes have been liquidated in Adult Schools in CA. How does this Parent Education Program work? each child is accompanied for the entire class period by a caring adult. Under the guidance of an expert, credentialed Early Childhood Educator and an experienced Teacher's Assistant, the children ages two to four prepare academically, socially, and physically for Kindergarten. This is truly class-size reduction as it should be. To "teach" up to 25 kids. Is this possible? Graduates from Parent Education Classes (which often include grandparents, aunts, uncles, adult siblings, and even caring adult neighbors) go on to success in K to college. educated pre-schoolers and which prepare their adult family members to support these little ones throughout their schooling. Also, the now defunct Parent Education Programs introduced immigrants, minorities, and the economically disadvantaged to how to succeed in school. It's now gone, without any media coverage nor public discussion whatsoever. Although there have been funding cuts, not all districts have cut these programs. Our district continues to provide a Mommy & Me program as well as a strong parent education component. These are foundational programs for all students but especially students living in poverty. @hetds It is a sad state of affairs that funding was pulled for these very important Adult Ed programs. My children attended parent ed heavy co-op preschools and I saw first hand how these preschools - really valuable community resources - are struggling to survive without that partial funding from the state. They are having to scale back the parent participation and parent ed component to attract a wider audience, not because they don't believe in those components, but because they need to survive. Given how little the fabulous teachers were paid in the first place, that partial support could not have been very heavy on the state. So many of us that were parents at these preschools are now in leadership positions in PTAs and beyond. Clearly we learnt something useful at these parent ed co-op schools. There are many other studies that show that poverty is the driving factor behind the achievement gap. Who funds this site? Thanks, Arienne -- Yes, poverty is massively entangled with achievement gaps. Poverty is discussed alongside race in Lesson 2.2, and the topic of Achievement Gaps is further discussed in Lesson 9.6. Regarding the funding of Ed100: the content of this site has been substantially driven by volunteers (including me). Funding for technical web site development, fact-checking and translation to Spanish has been provided (as of this writing) by the Stuart Foundation, the Kabcenell Foundation and Full Circle Fund. (The Noyce Foundation also provided some help very early on, when Ed100 was a PDF and a notion that it shouldn't be so hard for people of good will to learn about education issues in a coherent way.) If we add other major supporters (which would, by the way, be lovely), we will add them with our thanks on the About page. There is a lot of factors when studying the two different states. For example, are more students in poverty level here? Is the same curriculum taught in the same amount of time? Are the same tests given? It would be interesting to see a different states classroom and if they "run" their class close to the same. People in this community seldom take part in these topics. As far as parent involvement is concerned, they communicate with school staff during parent teacher conferences only. Thanks, Terirafiq -- you raise an important point. When I'm asked to describe the core audience of Ed100 my answer is parent LEADERS. Not all parents. Most parents aren't very interested in understanding the education system, much less influencing it. But some are, and that makes all the difference. Ed100 is designed in the belief that in each school community there are a few people who are determined to get involved and make their school the best it can be. Those are our people. They need knowledge to be prepared, persuasive and effective. Education is a huge system, and you can't influence a system responsibly without understanding it. The barriers to real understanding are high. Until Ed100, there was no reasonable way to learn about the system intentionally, in a holistic way, including the interconnections between issues and variations in perspective. That's the role that Ed100 exists to serve. It's not meant to be for everybody- but it IS for anybody who might feel drawn to make a difference. An Ed100 completion certificate represents an investment of time and attention in understanding the issues of a complex system. Okay but this is a far bigger topic than test scores. We all know that. Are they taking the same test in California and Massachusetts, etc? Is the curriculum the same? My daughter is being taught a chapter a week in Science in 8th grade -- that's crazy -- and someone tested on parts of a chapter they haven't even discussed in class yet! To me THAT is a bigger issue. What is being taught, the curriculum, and teaching kids to love learning. That is not happening for her right now. Does she have to wait until college? That may be too late. Hi, Gwen -- The challenging topic of how to measure success (for students and for schools) is a focus of Chapter 9. In answer to your question the NAEP test is the same nationwide, but there are some state-level variations in who takes the test (involving policies for English learners and students designated special ed). The NAEP test isn't the one that your kids take - it is given only to a sample of students in order to provide a way of getting beyond the political fray and approaching an apples-to-apples metric. Love of learning is an element of student motivation, discussed in lesson 2.6. The content of learning (the standards, curriculum and materials) is the focus of Chapter 6 ("The Right Stuff"). Thanks for the comment! Keep reading, and good luck in the drawing! I believe I have dismissed these statistics in the past attributing them to the vibrant immigration dynamics of this state. However, when I see that New York and Florida 4th grades are scoring above in reading it raises many questions. Very thought provoking lesson! I'd seek to understand how much California is spending per student, say compared to MA or TX. Thanks, MS. The ten-chapter "flow" of Ed100 is "Education is Students and Teachers spending Time in Places for Learning with the Right Stuff in a System with Resources for Success. (So Now What?). The topic of money is principally addressed in Chapter 8 (the chapter on "Resources".) Have a look at Lesson 8.1 and 8.2 for information about how California compares to other states such as MA or TX. My thought is that so many kids are transient - meaning they move from school to school based on parents finances. We desperately want to move out of our neighborhood but don't have the option unless we are willing to put our kids in a bad school just to save some money on rent and utilities. It's a hard choice that we make. But we stay where we are at so our kids have consistency. School and district boundaries make it difficult to keep your kids where they have established relationships/friendships. So we have to bite the cost of staying where we are at instead of being able to buy a home. It's a lose-lose situation. Thanks, Jenzteam. You might be interested in Lesson 5.1 in the "...in a Place for Learning" chapter of Ed100. This talks about demographics, and "catching up", but California, in my opinion, is unique in that we have a large number immigrants moving here all the time with children of all ages. How does this affect the test results, and do we have or are we using resources to support these students effectively. Could it be the number of new English learners will continually skew these results so long as we have families immigrating at such a high rate? While many students are behind...we cannot ignore California students who are above grade level. There is very little resources (if any) for these students. We have very talented and gifted students in CA but our education system expects them to sit, wait or tutor struggling students. We are holding many of our talented students back with lack of funding. We need an education system that serves all our students. Having recently been exposed to the "GATE" (gifted and talented) program from a child participant who declared it "boring, and no different than regular school work". I wonder if instead of making children wait for others to catch up, if we could perhaps hold ALL children up to the highest academic level and if any are struggling have those that have finished the work help those who are behind? Peer to peer assistance - it can only benefit the entire class. Emily, you might be interested in lesson 5.3, which addresses the topic of selectivity, and Lesson 2.7, which discusses the use of individual learning plans in the context of special needs. There is no state mandate or directed funding for GATE programs -- under Local Control Funding (LCFF) these are investment choices that districts and schools make. I agree. While there are many struggling to come close to meeting the basic standards, there is definitely a group of high achieving students that are being left out. The test scores being talked about are just for the PUBLIC schools and many parents of high achieving students who are able to are taking their students out of the public schools and turning to alternative schooling, whether homeschool, charter schools, or private schools in an effort to provide the challenge and interest that their children need. I am curious how much funding, class size, infrastructure and teacher training compares between CA and the other states? We have faced cuts in our education budgets for some time now due to the budget shortfall and it is only started to creep up again. Anyone has any data points or ideas? @AmosMickey: Regarding funding, have a look at ed100 chapter 8, which focuses on resources. California's large class sizes are discussed in lesson 4.2. For teacher training try using Ed100's search function to look for "professional development." For comparisons of California and other states on a variety of dimensions related to education, click over to EdSource.org and look for the "States in Motion" charts. California is also well behind other states in funding education. While correlation does not prove causation, I think we need to look at the funding to get at this problem. Thanks, Sherry -- I think you'll appreciate lesson 8.1, which examines California's skimpy funding for education. How have we as a state not been able to incorporate the best practices to let students succeed. We were not always this low. What influences distract our students from being able to learn? Perhaps the testing climate has produced a problem and we are testing ability out of our learners, no matter the demographic. I would also like to offer the evidence on creative learning as having a positive impact on overall academic ability in those parts of the country where arts education are standard in the K-12 educational arena - CA does not have arts education as standard curriculum complnents in the K-5 level. Other states that do have arts programming may score higher as a result. Thanks, Karen. For more about testing, please see lessons 6.5 and 9.3. On the broad topic of creativity, see 1.8. For the arts, check lesson 6.8. A full table of contents of lessons in Ed100 is available at our lessons page, and the search function, always available at the top of the page (look for the magnifying glass icon), searches across all of our lesson pages and blog entries. This is where parent-teacher groups (PTA, etc.) can have an impact. There are grants and funding available to help, but there need to be willing parent leaders and teachers to get it into the classrooms. Wouldn't it be great for teachers to assign various art projects as homework to solidify math or language concepts, even for the youngest grades? California’s students are behind disregard of the subgroup: This is known fact, and a consistent fact for many many years. The real question here is what has (have) been done to address the issue, and why the awful result continue to be a constant for California.